Blizzard unveiled the grizzled Overwatch hero Soldier: 76 a couple days ago, accompanied by an origin story video, a gameplay teaser trailer, and a lengthy bio describing his days, and his downfall, as leader of the Overwatch. Today, we've got something that's perhaps more in line with the interests of gamers who just want to shoot stuff. The 11-minute gameplay preview is exactly what it sounds like: 11 minutes of Soldier: 76 ventilating noobs. The action comes from the Point Capture map Hanamura, on which the 76'er and his compatriots are playing as the defenders. He seems to have a fairly straightforward play style, although that could be just the way his machine-gun comes off as the sort of thing you'd toss away the moment you find a real weapon. And I suppose that "straightforward" is exactly what you'd expect from a grizzled old soldier with a grudge. Flash and flair is for lightweights. 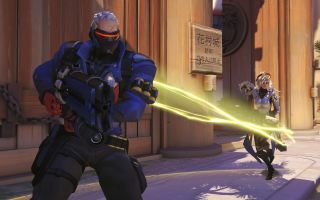 Overwatch is set to go into beta in the fall.